If you’re reading this article it means you are interested in the technical aspect of air compressors, and not just the results they can produce. This is great, because if you take the time to really understand how air compressors work, you will more easily find the right compressor for your needs. First, let’s classify compressors based on the way they compress air. 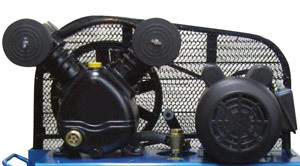 Reciprocating and piston air compressors are interchangeable terms, and this type of air compressor is the most common on the market today. They take advantage of the principle of positive displacement. When the piston moves down inside the cylinder, the air enters the space above thanks to the difference between the atmospheric pressure and the pressure inside the cylinder. The air is then compressed as the piston moves upwards. These are known as single-stage compressors. Two-stage compressors take the air in from the atmosphere just like single-stage units, but as you can see on the picture they have two cylinders instead of one. During the first stage, the air is compressed to an intermediate pressure. After that the majority of heat is removed, and the air is passed on to another cylinder where it is compressed to a specified value. This type of compressor has two mated helical screws located inside a chamber. As each of the two screws rotates, the air pressure inside the chamber is increased which effectively reduces the volume of air. However there is a drawback to this mechanism. This type of functionality creates a lot of friction and heat which means you have to cool the whole system down in an efficient manner in order to keep operation smooth. For this purpose lubrication is used however, do bear in mind that oil has to be separated from the compressed air before it can be used. This solution features fewer moving parts than the rotary screw approach. Basically, with rotary scroll compressors the compression within a scroll is carried out via the interaction of a fixed and an orbiting helical element which gradually compresses the air that’s drawn in. As a result of this continuously repeated process you get pulsation-free compressed air. This type of design may feature either splash lubrication, or an oil free design. 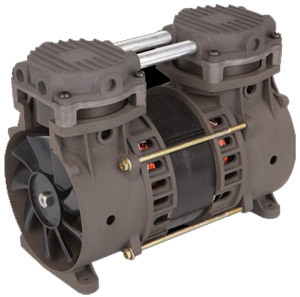 This type of compressor has a motor that consists of a rotor, stator, and blades. On one end there is an intake port, and on the other an exhaust port. 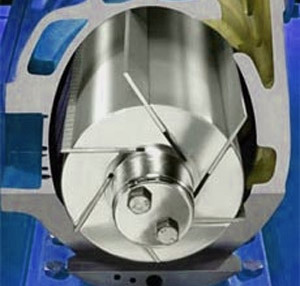 The stator is located between the two and also contains the rotor. The turning of the rotor increases the volume on the intake end, and decreases it on the exhaust end. The blades or vanes move outward and remain in place against the walls of the stator thanks to rotational acceleration. Lubricant is also used to reduce friction as well as to plug up any potential leaks. As is the case with rotational screw compressors, the air and oil need to be separated first. Unlike all the previous types of compressor, a centrifugal air compressor is not based on the principle of positive displacement. Instead, the principle they are based on is called dynamic compression. What this does is increase air pressure by raising the velocity. 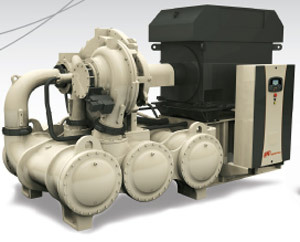 These compressors have an impeller that is able to rotate up to 60,000 times per minute. The air molecules are sped up first, and then slowed down with the help of a diffuser. In order to pull this off, centrifugal compressors have intercoolers which cool the air and remove any fluid that builds up in the process (since moisture can harm the motor). So, back to reciprocating compressors. 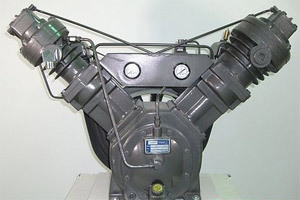 Rocking piston compressors are a variation of the standard piston-type unit although in this case, the air pressure is increased through a reciprocating interaction of a connecting rod and piston. Since the pistons on these compressors have non-metallic rings they don’t need splash lubrication. Another characteristic of these is they are smaller and deliver lower pressure values. 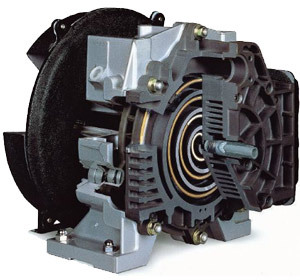 Oil-free compressors don’t require a lubricant in order to function. Instead, they have permanently oiled bearings. These compressors are convenient because they require very little maintenance, but they also have other advantages. They are capable of operating in low temperatures and on uneven terrain. On the flip side they have a tendency to heat up more, and are generally less suitable for heavy duty work. Splash lubrication employs an oil dipper found on the bottom of the connecting rod which dips into the oil bath, and splashes the oil onto the mechanical parts and bearings to reduce friction. Overall, this is the most common type of lubrication among piston-type compressors. They experience a lot less wear and tear than oil-free designs, and tend to heat up less. But their performance is questionable on uneven surfaces, and they do require proper maintenance (although they are better suited to heavy-duty applications). 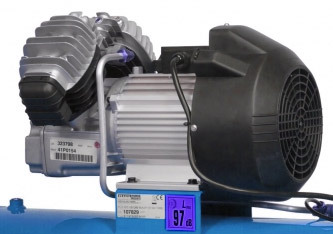 This type of compressor features an oil pump which supplies the oil to all crucial segments of the compressor with the help of a crankshaft, cylinder walls and the piston bearing. This system is extremely efficient, but it does costs more money. Compact portable oil-free compressors usually fall into this category since a direct drive is relatively small and requires minimal maintenance. 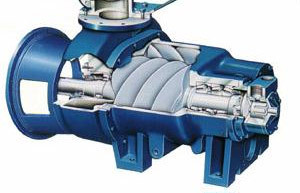 Compressors can either be flange-mounted or direct-coupled to the power source. Another benefit of direct drive compressors is their ability to deliver compressed air directly without filling the air tank first. Both gas and electric compressors employ a belt drive because it offers better flexibility in order to match the compressor load to a power source at the lowest possible price. However, in order to ensure the safety of the operator belts must have some sort of protective cover. Once you get deeper into the matter you will not only get an answer to “how” but “why” as well, and this article was written for that very purpose. I have plenty of air compressor reviews for you, but just in case you come across a unit that is not on my website you will at least be more than capable of figuring out how it works, what its key characteristics are, and of course whether or not you should buy it!